Total pledge of $[AMT] to be paid in one paymentTotal pledge of $[AMT] to be paid in [MTH] payments of $[PMT]Total pledge of $[AMT] to be paid in [MTH] payments of $[PMT]Total pledge of $[AMT] to be paid in [MTH] payments of $[PMT]Total annual pledge of $[AMT] to be paid in [MTH] payments of $[PMT], automatically renewing yearlyTotal pledge of $[AMT] to be paid in one paymentTotal pledge of $[AMT] to be paid in [MTH] payments of $[PMT]Total pledge of $[AMT] to be paid in [MTH] payments of $[PMT]Total pledge of $[AMT] to be paid in [MTH] payments of $[PMT]Total annual pledge of $[AMT] to be paid with monthly credit card charges of $[PMT], automatically renewing yearlyTotal pledge of $[AMT] to be paid in one paymentTotal annual pledge of $[AMT] to be paid with automatic monthly deductions of $[PMT], automatically renewing yearlyTotal pledge of $[AMT] to be paid in [MTH] payments of $[PMT], automatically renewing yearlyTotal pledge of $[AMT] to be paid in [MTH] payments of $[PMT], automatically renewing yearlyTotal pledge of $[AMT] to be paid in one paymentTotal pledge of $[AMT] to be paid in [MTH] payments of $[PMT]Total pledge of $[AMT] to be paid in [MTH] payments of $[PMT]Total pledge of $[AMT] to be paid in [MTH] payments of $[PMT]per monthper quarterper half yearper month Add RecipientAmountRemoveViewTotal:AddView T-Shirt DetailsItem out of stockSelected method of payment is not allowed for this item. Enroll your kids in the Rhode Island PBS Kids Club! Please click the Add Child button below to begin. We will make every attempt to include each child's name and birthday on-air. We cannot guarantee that your child’s birthday will be shown if you join during their birthday month. 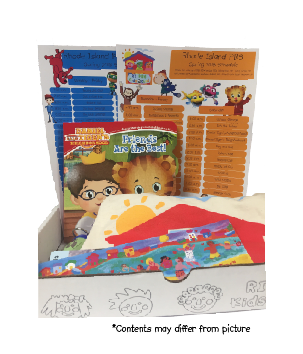 All Kids Club Members Receive a Welcome Kit!